Home Events LMAI Brand owners’ event a roaring success! LMAI Brand owners’ event a roaring success! Label manufacturing continues to evolve into different tangents involving diverse technologies. The retail selling scenario is undergoing a sea change as also the need to make consumers repetitive buyers of branded products. The times of shopkeepers promoting sales of their preferred brands is transforming rapidly into one where the consumers decide on their own what to lift off the shelf, given the modern retail growth. In view of growing need for printers having capabilities to produce decorative and innovative labels that catch the consumer’s eye providing brand security and enhancing the brand’s image as well; there is an imperative need for brand owners to connect with the label converters. 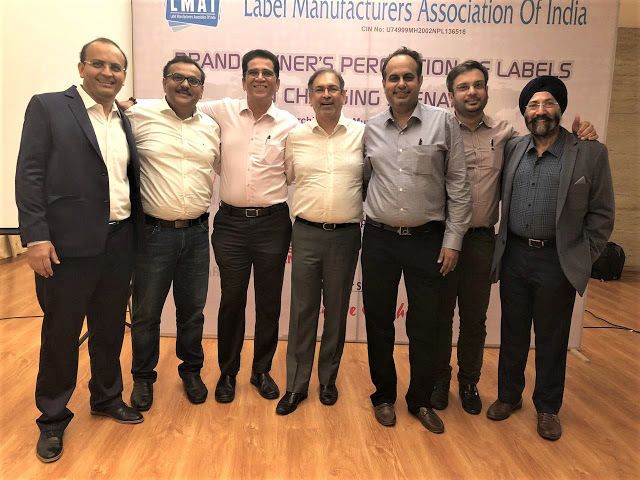 In such a scenario, India’s label association, Label Manufacturers Association of India (LMAI) organised a program exclusively for label printers titled, “Brand owners’ perception of labels in changing scenario” at hotel, The Orchid, Mumbai. The program was attended by over 100 delegates comprising mostly of top end label printing companies, packaging professionals of renowned brands, sponsors and LMAI board members. It was an effort to promote the positive escalation of labels in a changing scenario bringing the stake holders at a single platform to strategise a win-win solution. Other Packaging industry professionals who attended the program include Fazal Farooqui DGM Packaging Development Zydus Wellness formerly Kraft Heinz Company, Sunil Patil-HPCL and Koel Bhadra-Packaging development Professional. Delivering the keynote address Suresh Gupta, former Chairman Huhtamaki-PPL expressed his philosophy of success for the entrepreneurs present, “Sound fundamentals are enshrined in Good values; being Good compassionate people, knowing knowledge is power to be used with integrity, ever improving quality and service and continuous innovation makes for happy customers. Be the flag bearer of standard in your industry” He further cautioned printers to be ready; for the present equipment to become outdated in 5 years due to fast evolving label technologies and be ready to invest in new equipment after properly understanding the technology. Impressing upon the fact that Digital printing is the future. Prabir Das, Head Packaging Technical Services (OSD) of Mylan laboratories spoke about Importance and effectiveness in Product-People Connectivity where packaging is the connector and labelling is the communicator. It is a necessity therefore to design the packaging that establishes the connection and the regulatory and statutory information is communicated through the label. Somnath Chatterjee, General Manager Procurement of Pernod Ricard said that labels must appeal delivering a lifestyle message. He also stressed the need to reduce wastages. Referring to the increase in counterfeiting in liquor, Somnath invited printers to offer them unique solutions even though they themselves are already implementing security measures to safeguard the interests of there consumers. He felt that it is important to get all stakeholders in label production to ponder over the needs with the end user consumer in mind. Ajay Bapat, associate director packaging development, Emcure Pharmaceuticals informed about the necessity of right information, cleanliness and the need for smart labelling. Anil Choubey Head of Packaging Development Patanjali Ayurved Limited spoke the need for effective, sustainable and eco friendly labels and would be looking forwards to printer suppliers offering such products. Vishwas Jangam Packaging Development Manager of Future Consumer Enterprises Limited the company that owns Big Bazar chain of retail malls and stores spread across India, dwelled on specific needs of designs for labels on the shop shelves. Modern day retail that is growing at 21% CAGR needs the attention of the consumer who makes an impulsive buying decision in just about 12 seconds. The event was moderated by Ainain Shahidi a packaging industry professional and now the director of SIES School of Packaging. He enthralled the audience with his amazing Urdu poetry and couplets while leading the flow of event. He also apprised the audience about the activities of SIES School of packaging. Before presenting vote of thanks, Manish Desai past President LMAI, announced the next LMAI conference at Grand Hyatt Hotel, Kochi on July 2019, the Indian label Industry’s most important and biggest event. The event was sponsored by Avery Dennison and SMI Coated Papers as gold sponsors and Creative Graphics as silver sponsors. Manish Desai while thanking the audience felicitated with mementos the speakers, the moderator Ainain Shahidi, the packaging professionals who attended and Harveer Sahni who curated this event with help of LMAI leadership team. Leading printers who attended included Amar Chhajed from Huhtamaki-PPL, Vivek Kapoor-Creative Labels, Chandan Khanna-Ajanta packaging, Manish Desai-Mudrika Labels, Tejas Tanna-Printmann, Arvind Shekhar-Sai Packaging, Aditya Patwardhan, Mahendra Shah-Renault Paper, Sandeep Zaveri- Total Prints, Naveen Goel-Any Graphics, Rahul Kapoor-JK Fine prints, Patricia-Letragraphix, Sandhya Shetty-Synergy Packaging, Anil Namugade-Trigon Digital, Sanjay Purandre -Shree Ganesh Graphics and so many more.